I am interested in “quantum engineering”: application of quantum mechanics. I do theory, and like elegant mathematics geometry, and animations. You may enjoy the visualizations even if the mathematics and physics does not really interest you. 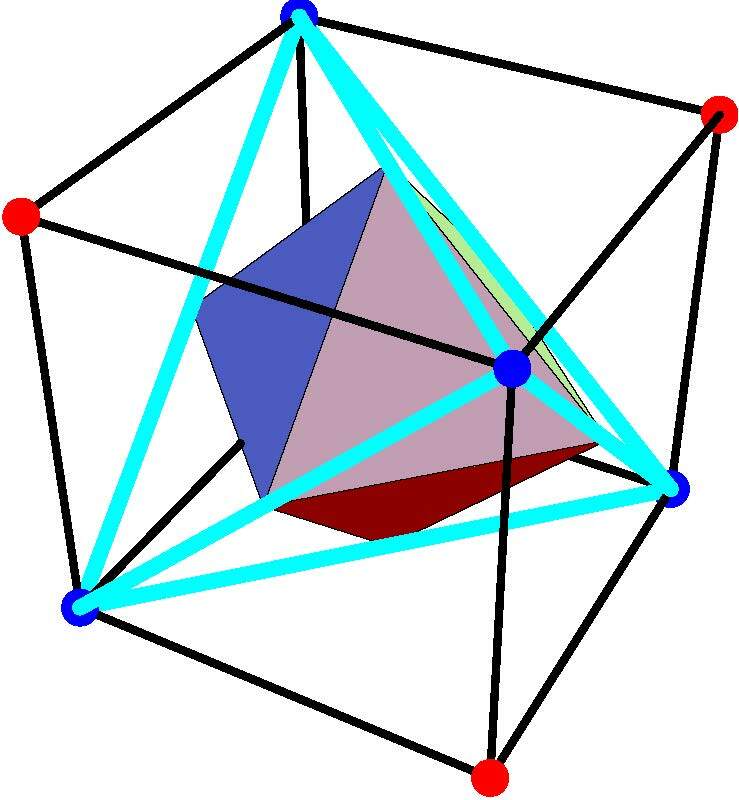 Topological quantum numbers in open systems, Banff, (2013). Baron von Munchhausen and the cat, KITP colloquium, (2011). 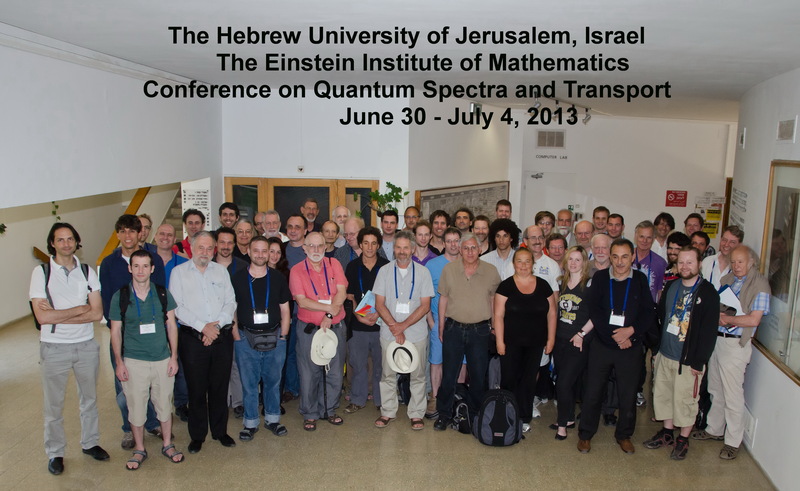 Topological quantum numbers, Jerusalem winter school (2011). Quantum swimming, Newton Institute, Cambridge, (2007). Should biologists care about quantum computing?, RBNI winter school, Dead Sea, (2010). 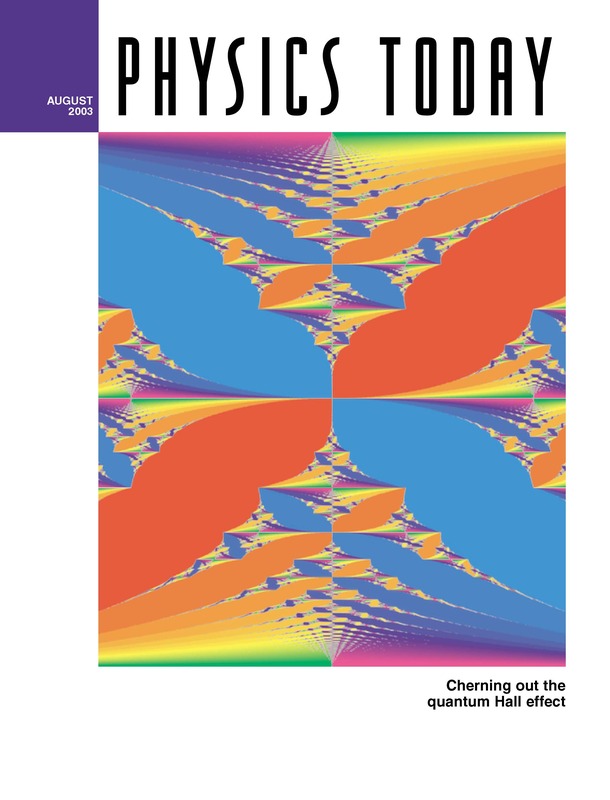 A Topological Look at the Quantum Hall Effect, Physics Today 56, (2003), 38-42. Flexible Ring Interferometers, Smilansky Fest, Rehovot, 2016. Michael Shalyt, Control of a 2-Level System to Reduce Colored Noise, 2013. Lev Kvitny, Entanglement in Quantum States, 2011. Eli Meirom, Entanglement in Radiative caascades, 2008. Oren Raz, Swimming, Pumping and Gliding at Low Reynolds Number, 2007. The motion of small organisms and microbots is dominated by viscosity and inertia is largely irrelevant. This makes this mode of locomotion foreighn and unituitive. Its mathematical appeal comes from the fact that it is geometric in character. Pushmepulyou: The three linked spheres is an elegant model of a microswimmer invented by Njafy and Golestanian. Inspiredd by their work, David Oaknin, Oded Kenneth and I invented Pushmepulyou. By pressing START you will see a swimming competition between the two swimmers. For more informatio see. Purcell swimmer: Perhaps the most important caricature of a micro-swimmer is the one invented by Purcell. It is made of three linked rods and mimics a flagellum, it also illustrates the unintuitive nature of the motion at low Reynolds numbers and it is a challenge to guess (given the stroke) it will swim. It is also very hard to analyze mathematically. Together with my student, Oren Raz, we invented a symmmetric version of Purcell swimmer which is intuitive and that removes some of the mystery. For more see. Cats always fall on their feet and they do so without relying angular momentum. Rotations at zero zangular momentum look surprising, but they are possible if a body is deformable. The image of a cat in the animation above shows how a sequence of non-commuting deformations lead to a rotation. This is a simple example of holonomy. The mathematical description is quite pretty and geometric and there is huge literature on this problem. For my work see. Baron von Munchhausen claimed to have pulled himself, and his horse, out of a swamp by pulling on his hair. This is a tall story because it conflicts with Newton’s laws. However, as Jack wisdom noted it is not such a tall stroy in a curved space. Wisdom was interested in swimming away from blach holes. 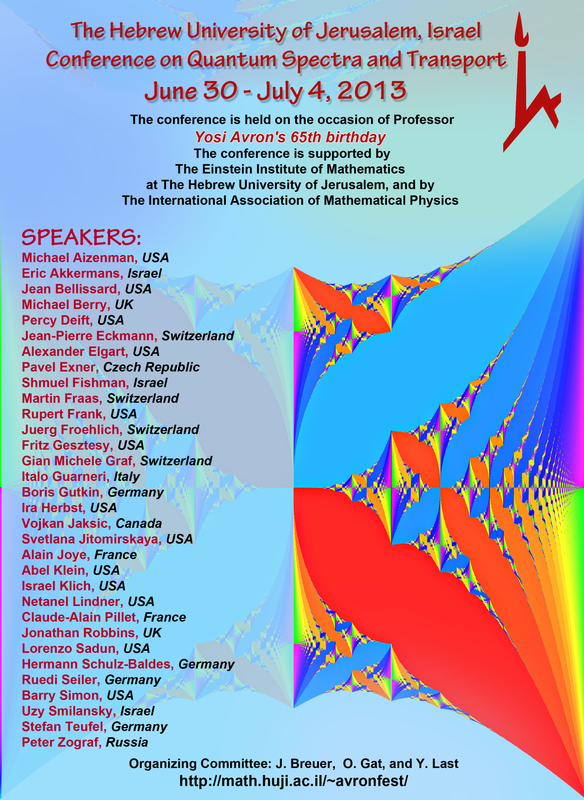 Together with Oded Kenneth we developed a theory of swimming of deformable bodies in isotropic and homogeneous spcaces. In the animation above, the same stroke propagates the swimmer in opposite directions because the curvature of the ambient space is opposite. 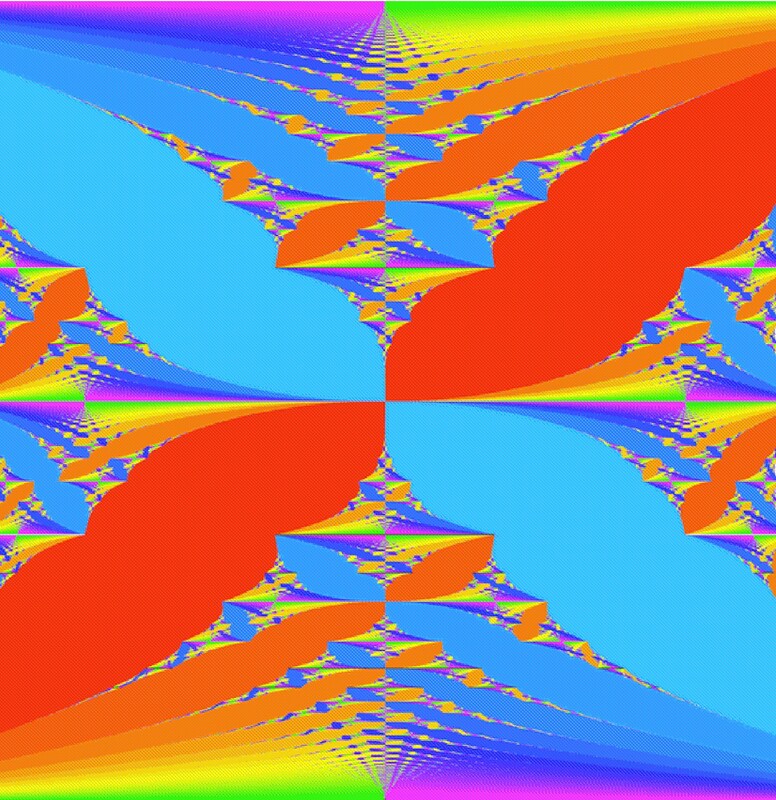 The colored Hofstadter butterfly shown below is pretty fractal, pictures that arises from the solution of an simple looking single linear equation that is a model of the quantum Hall effect. The picture was made by my student Daniel Osadchy as part of his MSc. A Matlab code for making the picture is available from his home page. and it is called a hofstadter butterly because Douglas Hofstadter, the author of the best seller “Goedel Escher Bach” made the black and white version of the butterfly back in 1976. 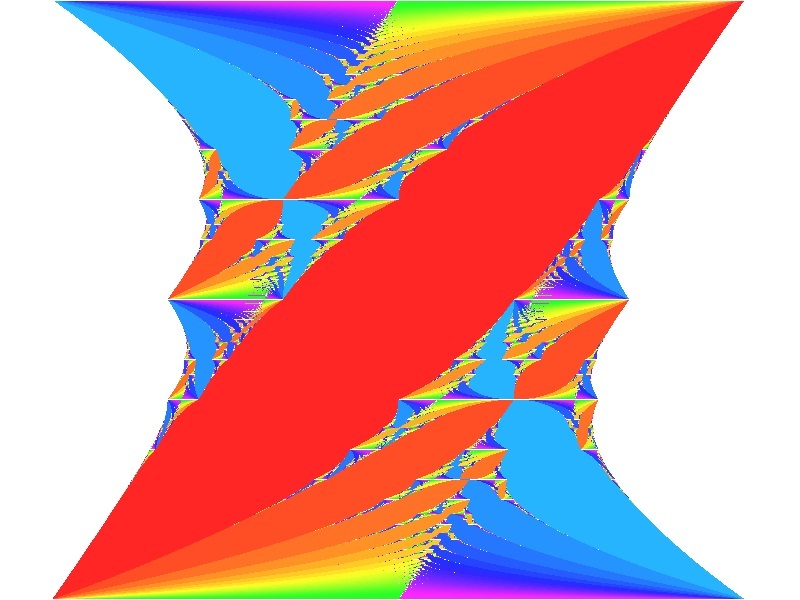 The colors in the diagram represent intgeres known mathematically as Chern number and physically as the quantized values of the Hall conductance. These integers were not known in 1976: The Hall effect was only discovered in 1980 by Klaus von Klitzing, who recieved a Nobel prize for it. 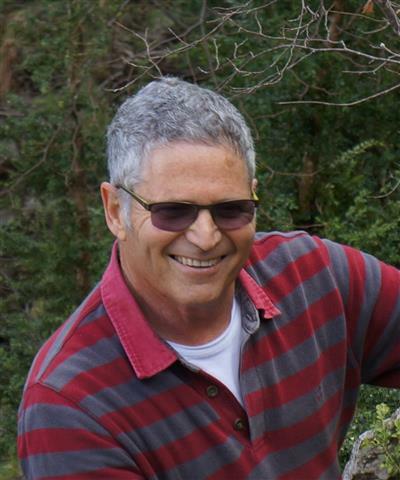 David Thouless and coauthors, TKNN, studied the Hosftader model in this context and showed that the Hall conductance is related to Chern numbers. For more, see.